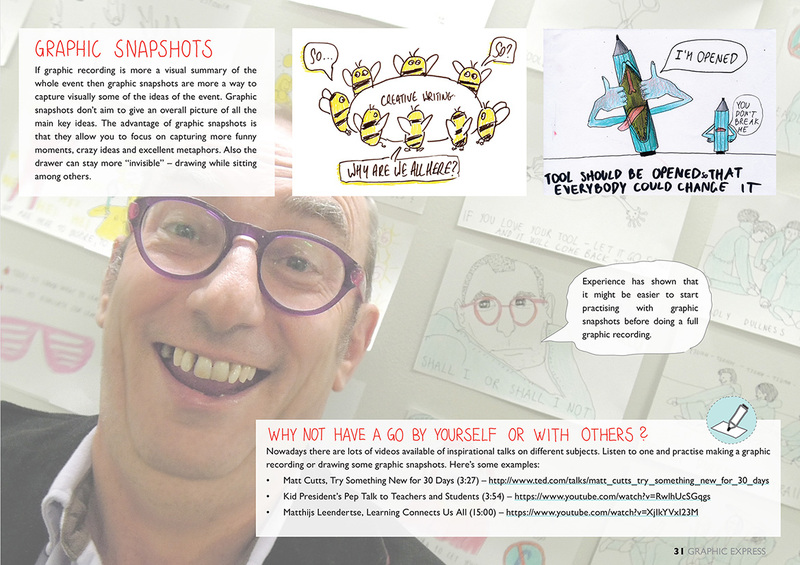 What are the differences between graphic facilitation, graphic recording, graphic snapshots and visualised messages? How do we use them all to facilitate learning? Can I learn to draw and even have the courage to draw in front of other people? The annual Tool Fair has played a crucial role in bringing this publication to fruition. Siiri and Tanel of Joonmedia were engaged by the Estonian national agency to follow the Tool Fair in Tallinn in 2011 and caught everyone’s imagination with their graphic snapshots. You can read more about that in the first edition of the Tools for Learning magazine from November 2012. During the next Tool Fair in Pultusk, Poland, Agata Cieslak also produced drawings and cartoons to highlight events. And it was there that the idea was born to explore the possibilities of spreading the graphic facilitation virus via a training course to be run at the next fair in conjunction with the Hellenic national agency in Delphi, Greece. Buzz Bury and Mark joined Siiri and Tanel to complete the team. Twelve participants were empowered to attend all the workshops and events and they produced many examples of graphic snapshots and recordings which were added to an exhibition on a daily basis. You can find many examples in this publication. 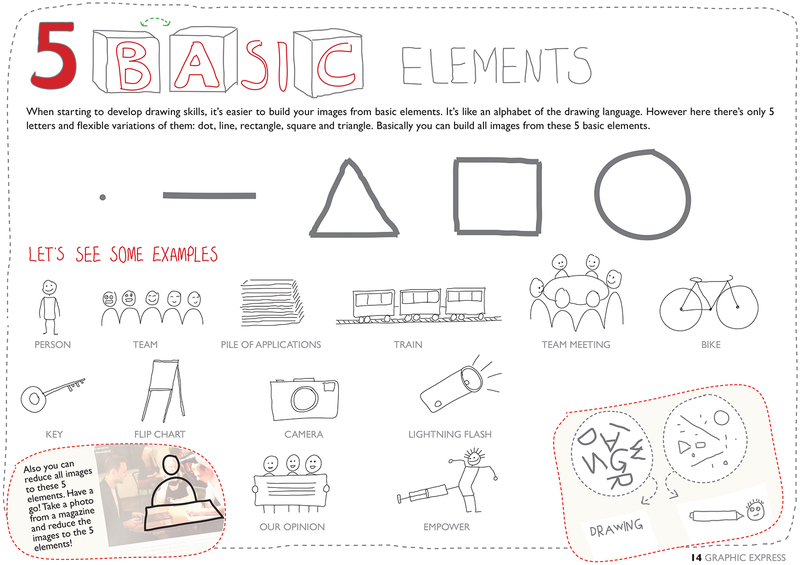 You can draw anything if you just use the "5 Basic Elements": dot, line, triangle, rectangal and circle! "A drop of water representing the ocean!" A captured moment of an outcome or process. Like taking a photo of what has happened, or a concept, or a result. 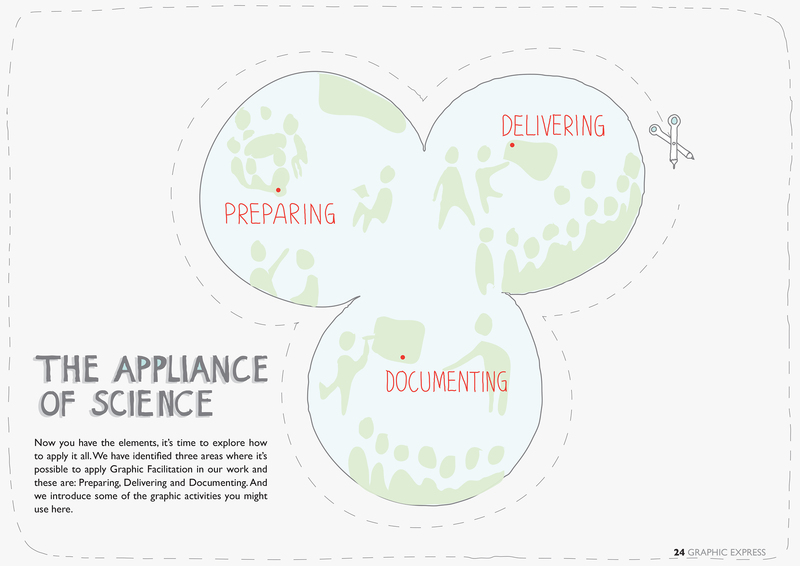 How to be a graphic facilitator: preparing, delivering and documenting! Have you heard of Monsieur Jourdain?